Google Chrome has crossed the popularity of Firefox and becomes the number one web browser. The skinny design and fast loading speed help it to beat other browsers. Though this skinny light design is very helpful, it does have its own negatives too. This skinny design may sometimes make us close tabs accidentally. This tutorial explains how to recover the recently closed Google Chrome browser tabs on your computer. We can recover the last terminated tabs by multiple methods. Use the combination [CTRL] + [Shift] + [T] to open most recently closed Chrome tab in your computer. If you want to recover second last terminated tab, you may need to press the same keyboard combination. If you press the same set of keys again, third last closed tab will open. In my personal experience, it is the fasted way to recover closed Chrome browser pages on a PC. Start a new tab and look at the thumbnails displayed there. It shows a list of recently terminated tabs and we can restart anyone of them from the list. Just click on any on the thumbnail will open that specific tab. A major advantage of this method is the control over the specific tab reopening. You can select the right page you want to reopen without repeating the process from the most recent to last. You can go to Chrome history and open any previously closed page. To do this either press [CTRL] + [H] or type chrome://history/ on address bar. It will show complete list of previously closed Chrome pages. You can restore any pages listed there by simply clicking on them. This trick also gives the freedom to select the right page you want to recover from the list, without repeating the same process. 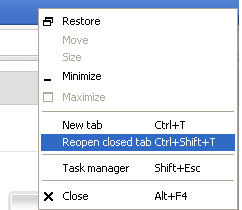 You can right click on the top of the browser, and select the option to reopen the recently closed tab. By these four methods,s you will not find any difficulties to recover recently terminated pages. My personal favorites to start most recently terminated page are method one and four. These two methods don't bother to give an option from which we must select the right page to reopen. However, if you want to reopen a specific web page from the list of terminated pages, methods 2 and 3 and fine. You can go to Chrome history and open any previously closed tab in your browser. To do this eith press [CTRL] + [H] or type chrome://history/ on address bar. It will show complete list of previously closed Chrome tabs in your computer. Just click on any link which you need to restore. this is not true. chrome://history/ shows list of recently OPENED tabs, not recently closed. This means that they are sorted by date of opening, not date of closing. If anyone know how can I sort them by date of closing, I'd be very grateful.